1. As I mentioned in my previous posts, my writing life is currently getting a serious spit ‘n polish thanks to a reading of Anne Lamott’s Bird by Bird. 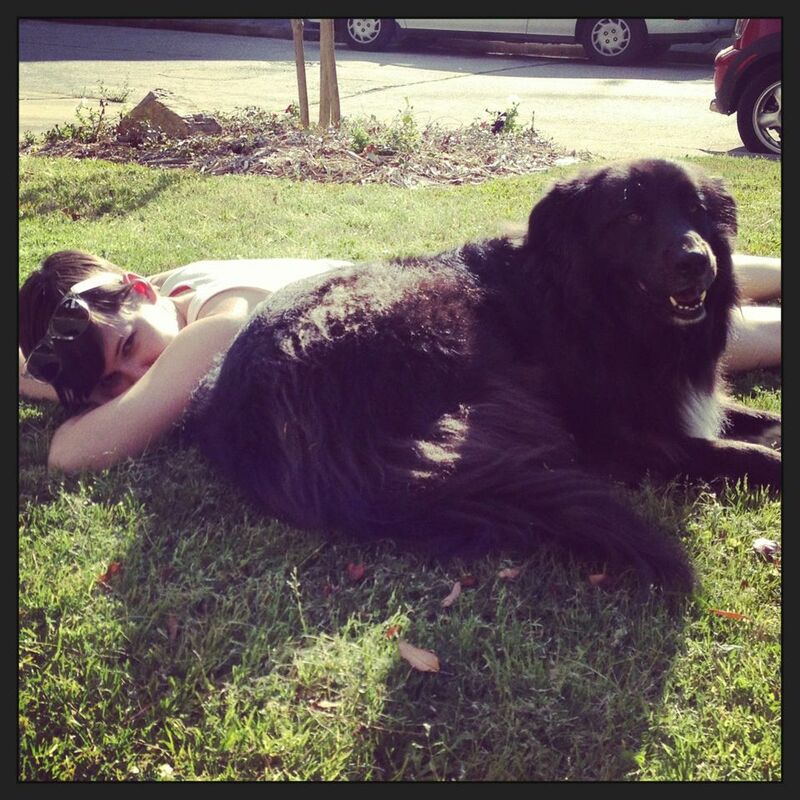 Which brings me to my first story … my dog has serious thunder anxiety. She paces and whines and drools and claws at all the doors in our house. And if you don’t pay attention to her, it escalates into barking and more clawing. If there’s a storm in the forecast, it basically means either my husband or I is staying up all night with her (and it’s often me, because I’m not the one who has to get up and go to work in the morning). We basically have to dope her up on valium during storms, and even that doesn’t always work. But last night was one of the nights where it (sort of) did, and somewhere around 1am I found myself sitting on the couch with a panting, drooling, very very stoned dog while a thunder storm raged outside. And my first thought wasn’t “I’m so tired!” or “Dear God, please take her hearing so we can move on from this!” Nope, it was “oh man, my main character needs an anxious dog. And then I could do this great scene during a storm in her bedroom, and then…” So yeah, don’t be surprised if a version of lil Lucy appears in my next book! 2. Tomorrow, 1pm-3pm at the Macon Barnes & Noble on Riverside Drive, will be my very first author event (not counting my launch party). And I’ll be ALL BY MYSELF! I’m really excited about it, especially after stopping by the store and seeing all the awesome displays. So if you’re in the Middle Georgia area, or want to take a road trip, I definitely recommend coming to this one. 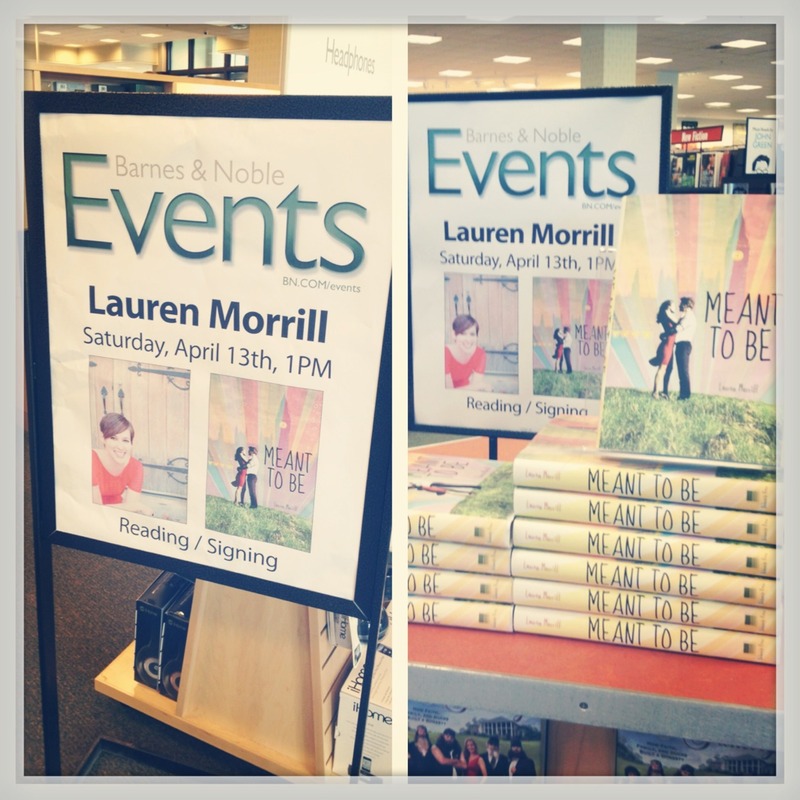 And if you’re not in the Middle Georgia area, check my events page, because I might be coming to a city near you! Houston, New York, Chicago, Nashville, Chattanooga, Asheville, Atlanta … I’m coming for you all! 3. Yesterday I got to return to Mystic Falls! 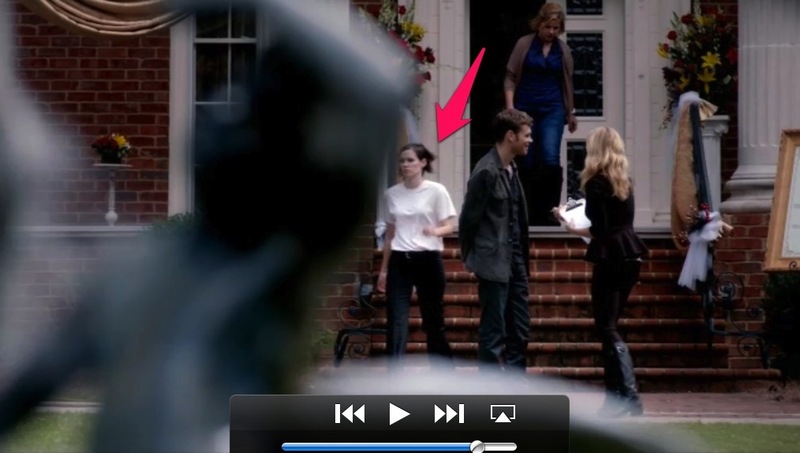 Yep, I’m going to be an extra on Vampire Diaries again, this time for my fourth episode! (read about my other visits here and here). I can’t tell you anything about it other than it was the season finale, I got to fake eat some french fries outside the Mystic Grill, and then something REALLY COOL happens. Since this is the season finale, I won’t have any more cool TVD stories again until probably August (when they start shooting the fall season), but hopefully then I’ll also have some cool Originals stories, since they’re likely filming the spinoff here as well! More Klauss (yes yes yes). 4. Next weekend, all your Houstonites can find me at Teen Book Con, which I’m so freaking excited about. Not only do I get to meet a ton of readers and talk about books, but some of my very favorite authors are going to be there! First of all, Barry Lyga’s sequel to I HUNT KILLERS comes out on Tuesday, so I will most certainly be devouring that book (and the constantly checking over my shoulder … ). Plus I’ll be on a panel with Amy McNamara, and I absolutely loved her YA contemp LOVELY, DARK, AND DEEP. 5. And finally, big congrats to my author friend (and fellow Maryville High School alumna!) Kathryn Holmes, who got an agent for her awesome YA contemp, The Creation of Hallelujah Calhoun. I got to beta read this one, and it’s so great. Definitely keep your eye out, because I’m sure it’s only a matter of time before it’s coming to a shelf near you! 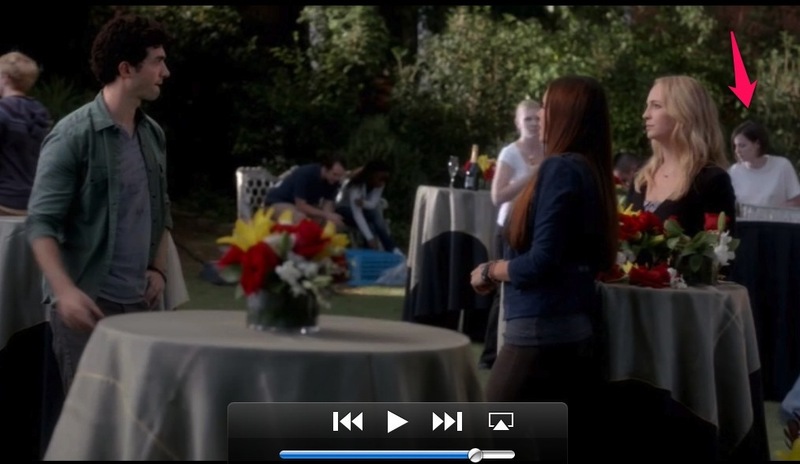 And now, for my most prolific extra work, in TVD Season 4, Episode 7: My Brother’s Keeper (aka, The Miss Mystic Falls Pageant). 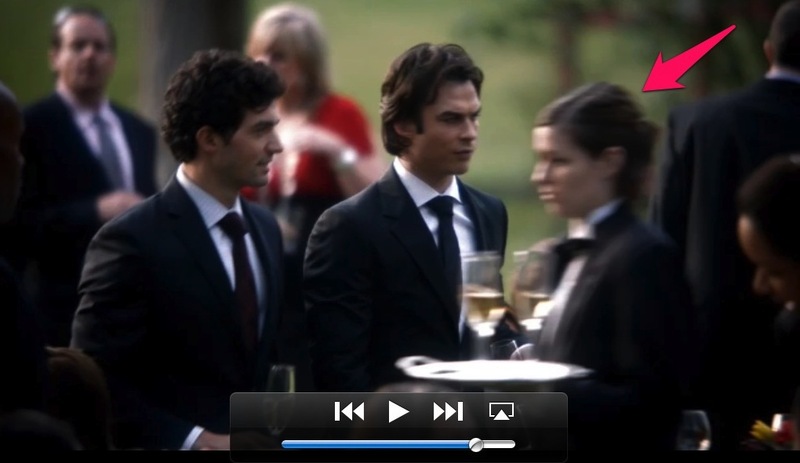 Yep, who knew I was such a competent bartender … oh, and Dave Alpay, who plays Professor Shane? Super nice guy! He follows me on Twitter now. Yes, I got to spend A LOT of time standing next to Klaus while filming this scene, and yes his accent is just that dashing in real life. Bird by Bird is such a good book! I love the 1 inch by 1 inch picture frame idea. Must read it again. Thanks for the shout-out! Good luck with the BN event—it sounds great. So excited to see you when you’re in NY in a few weeks!